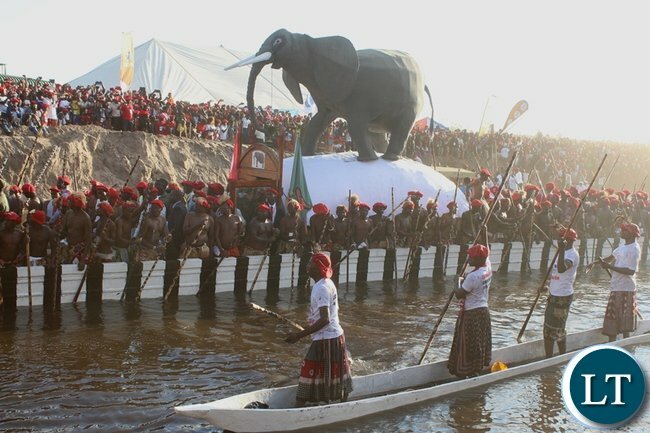 The Barotse Royal Establishment (BRE) has cancelled this year’s Kuomboka ceremony of the Lozi people of Western Province. This is due to low water levels on the Zambezi River. Briefing the media at the Kuta, BRE Ngambela Manyando Mukela said although preparations for the ceremony started on a high note, the water levels on the Barotse flood plains have remained below the normal level for this time of the year. He expressed regret that this year’s annual Kuomboka ceremony has been cancelled. The Ngambela said although the province has had poor rainfall this season the BRE had hoped that the high rainfall areas of Angola and the Democratic Republic of Congo (DRC) would channel the usual surge of water to most big tributaries of the Zambezi which however has not come forth. He has however assured supporters and well-wishers that the donations accrued so far will be accounted for and saved for the next Kuomboka ceremony. ZANIS reports that Mr. Mukela expressed gratitude to all Kuomboka Kufuluhela committees and partners for their invaluable support towards the colorful Kuomboka ceremony. It’s such a shame that Barotse business operators in colussion with their Lusaka counterparts have continued to cut down trees mwa Bulozi which is the reason for the lack of rains.The KUTA must issue a declaration that no trees will be cut or ferried from the area for the next 5 years and henceforth there should be an aggressive reforestation project in Barotse land and Zambia in general. What happened to the millions of dollars earmarked for boreholes and fish farming mwa Bulozi? @donqueen well said deforestation is one of the major causes of low rainfall and it’s sad across Zambia charcoal burning is allowed to continue dispute this fact being known. Just as well. We don’t want people bumping in each other’s motorcades. #4 Ndanje Khakis, exactly my thoughts….. kikikikikiki… he must be disappointed … trib.al I mean. You will observe that there is dry disaster wherever trib.als have set their feet. So are trib.als reluctantly going to attend national prayers this time? Please a sensible trib.al must impress on all trib.als that by attending they are not praying to Lungu like they pray to trib.al Hacks. Lungu just attends like any other but of course mobilising citizens to attend. God then listens to the prayers and allocates appropriate amounts of blessings or cursings. Gay Jay trib.al, you have neen assigned to convert trib.al Hacks. This is an emergence, HH should immediately ask his dogmatized blind followers to heed to ECL’s call. National Prayers, after all the small god of Dundumwezi is the one who has been stopping them. For the first time Northwestern province has experienced less rainfall while the North, Kopala , East and non-Tonga regions of Central received overflowing favor from the Almighty. Double favor.